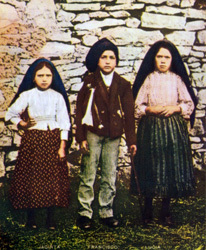 In spring in 1916 Lucia Dos Santos age 9, and her cousins, Francisco and Jacinta Marto, ages 8 and 6 respectively, were at a meadow with their sheep in (hamlet of Fatima). It started raining, and they hid in a small cave to escape the rain. After the rain stopped and the sun came out, they stayed in the cave to eat their lunch, say the rosary and play a game of jacks. They had played but for a short while when, on the serene day, a strong wind blew that swayed the trees and a sudden white light enveloped them. In the middle of that light appeared a cloud in the form of a young man who said to them: "Fear not! I am the Angel of Peace. Pray with me!" The angel knelt on the ground and bowed very low. The children imitated the angel and repeated his words three times: "My God, I believe, I adore, I hope, and I love You. I beg pardon of You for those who do not believe, do not adore, do not hope, and do not love You." Then he rose and said: "Pray this way. The Hearts of Jesus and Mary are attentive to the voice of your supplications."